This flash dryer is very heavy duty. The temperature is over 400 degrees F at distance of 3" below the flash heating element. It can easily cure plastisol ink for silkscreen printing.Easy operation: After well installed, connect the power supply and turn on the switch and then it will work automatically. With four universal locking casters, easy move. Sturdy design with powder coated housing to prevent rust. US, Canada Plug standard easy assembly. As the final equipment in screen printing, flash dryer play an important role. This heavy duty flash dryer will be the great helper to make your work done. 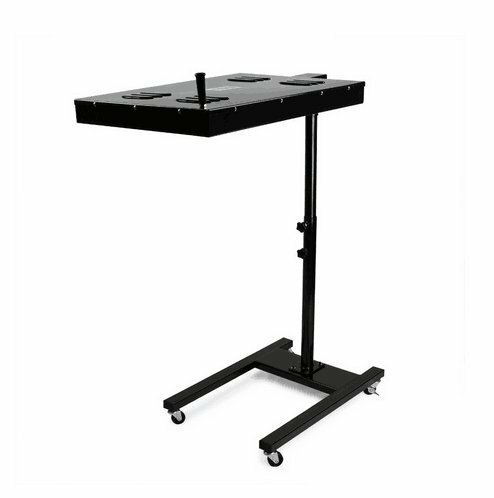 Adjustable height floor stand from 24" to 43"
Heating Area: 18" x 24"
Adjustable height floor stand from 24" to 43". Rotating and Adjustable Stand.Heavy Duty Steel Construction. Use panel with hundreds of wires flowing through it to provide consistent heat throughout the heating area. Foundation is consistent with heating box, stable, saving-space and overcoming the flaw caused by traditional "+" that easily gets knock and stuck. View More In Screen Printing Kits.